If you reside in one of these neighborhoods, please call 872-225-2738 to make an appointment. Our mobile spay/neuter program is designed to bring services directly to communities in need. With the GusMobile Spay/Neuter Van, we bring the services of the Lurie Clinic directly to neighborhoods that need them, where distance and access to the Clinic is a challenge. The GusMobile surgical unit was donated by the Beck family and named after their lovable dog Gus, who was adopted from PAWS Chicago after being rescued from the Iowa floods in 2008. The GusMobile proactively brings PAWS Chicago’s spay/neuter surgeries to the people who are the most in need and who lack the ability to travel to the Lurie Clinic. In addition to providing free and low-cost spay/neuter surgeries and vaccinations for pets undergoing surgery, the GusMobile maintains a regular and positive presence in those neighborhoods by also providing outreach and humane education. With these facilities, the GusMobile can accommodate up to 50 surgeries every day. 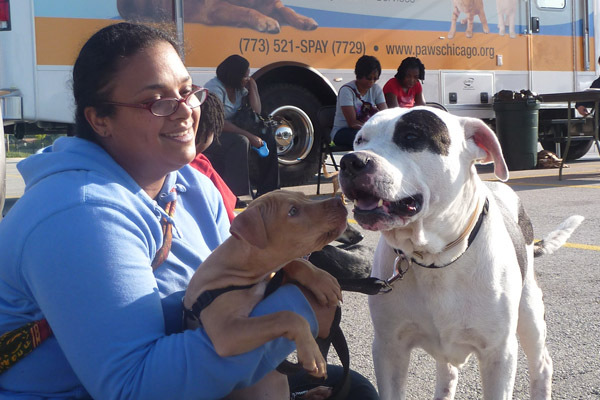 The GusMobile Spay/Neuter Van works in conjunction with PAWS Chicago's Outreach programs. The GusMobile operates April through October and serves the Englewood and Back of the Yards communities with free spay/neuter surgeries. If you reside in one of these neighborhoods, please call 872-225-2738 to make an appointment. All other residents, please refer to the Lurie Spay/Neuter Clinic page for appointment information. Customer Service representatives are available Sunday – Friday, 9 a.m. – 5 p.m.